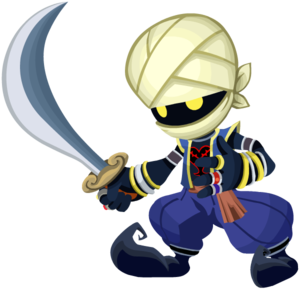 Heartless that mostly appear in Agrabah. They can travel under the sand. They attack deftly with a long sword. Attack them with caution. 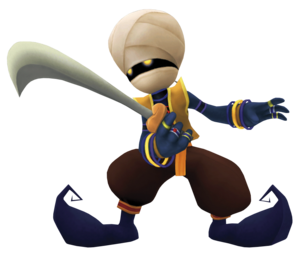 A Heartless that mainly appears in Agrabah. The Bandit deftly wields the scimitar it carries, and should be approached cautiously. Heartless who hang their hats in Agrabah. Don't let them trick you into rushing in blindly—those long swords they carry aren't just for show. Take your time and fight them on your terms. Make any normal attack as strong as a finishing blow. The Bandit is an Emblem Heartless found in Kingdom Hearts, Kingdom Hearts Chain of Memories, Kingdom Hearts II, Kingdom Hearts coded, and Kingdom Hearts χ. The Bandit boasts a bright white turban and matching face mask, a purple vest trimmed in gold, purple pants with plum and silver trim that is held in place with a salmon-colored sash, blue curled-toe shoes, and a plum and silver choker, and set of armbands. They also wear lots of gold and silver rings and bracelets, perhaps showing off the spoils they have plundered. Their large gold-hilted swords resemble classic scimitars. Kingdom Hearts Final Mix Bandits are dressed in yellow and dark reds instead of purple and blue, a color scheme mirrored by their successors in Kingdom Hearts II, the Luna Bandits. 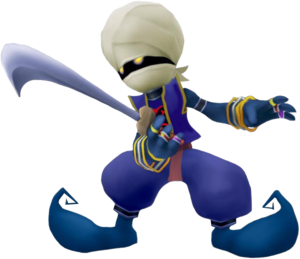 The Bandit's name references the Heartless's resemblance to Arabian thugs. Historically, bandits were outlaws that would commit crimes such as robbery or murder. Jafar summons four Bandits to assist him and Iago in finding Jasmine. When he spots her with Sora, Donald, and Goofy, Sora sends the princess off while he and his party fight off more Bandits. Later, Aladdin uses the magic lamp from the Cave of Wonders and summons Genie to get rid of a group of Bandits surrounding them both and their new allies. Bandits appear in a short cameo, during the cutscene shown after Sora learns of Jafar being released. If timed correctly, Sora can earn Tech Points for blocking the Bandit's attacks. The Bandit appears as a bonus costume in Kingdom Hearts Mobile for clearing Episode 5 of Kingdom Hearts coded. ↑ Bandits do not give EXP when the time has been frozen. ↑ Before Kairi's rescue, 2 Tech Points can be earned for blocking a basic scimitar swipe in both Kingdom Hearts and Kingdom Hearts Final Mix. ↑ Before Kairi's rescue, 4 Tech Points can be earned for blocking the Bandit as it throws itself and its scimitar in Kingdom Hearts Final Mix. ↑ After Kairi's rescue, 27 and 45 Tech Points can be earned for blocking a basic scimitar swipe in both Kingdom Hearts and Kingdom Hearts Final Mix. ↑ After Kairi's rescue, 90 Tech Points can be earned for blocking the Bandit's scimitar as it twirls itself around in Kingdom Hearts Final Mix.